As the temperatures start to rise across America we find ourselves testing out a ton of great BBQ products. Here are just a few that we recommend you take a look at. Joe “Mike” Mazanec was a master griller and BBQ champion. Taking on “Papo Joe” from his grandkids, he was truly one of a kind. The Original Rub, created by Papo Joe himself, this has been a secret recipe for over 50 years. Upon his passing in 1992, the tradition has been passed down to his son and grandson. Upon his passing in 1992, the tradition has been passed down to his son and grandson. Jason, diagnosed with Muscular Dystrophy at 18 months of age, and who has been in a wheelchair for over 20 years, is an inspiration to the BBQ community and people of all abilities that you can accomplish your goals no matter what setbacks you might encounter. Having a fantastic sense of a humor and a “can’t stop, won’t stop” attitude, Jason has quickly climbed through the ranks of the Steak Cookoff Association while competing alongside some of the best cookers in the world. From the competition circuit to the business circuit, Jason opened Papo Joe Grilling Supplies with his newfound knowledge and skills. We can tell you that all of these rubs are winners and some have even been proven in the competition arena. Jason and his family have a bright future ahead of them and we look forward to seeing much more from this crew in the near future. 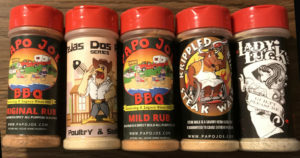 You can learn more about Jason, his adventures, and products at their website www.PapoJoe.com. If you have been around any barbecue or grilling competitions in the past five years then the name Johnny Joseph will not be new to you. Johnny is a three-time World champion steak cooker and all-around ambassador for all things that smoke. We first met Johnny back in 2013 in San Marcos Texas during the very first SCA (Steak Cookoff Association) sanctioned event that was held in conjunction with the NBBQA yearly conference. He was a true champion then and is still walk- ing around with the bullseye on his back as the man to beat in the steak world. Now you can compete with his secret seasoning on your steak as he has introduced his soon to be famous steak rub. When we opened the packaging it looked like a typical red barbecue rub but once we started sprinkling it around we found it fit well with everything! By itself or not used with a baste it can be a touch spicy (which is great for us at home) but could hurt if the wrong judge had your sample. I had a short Q&A with Johnny and he shared that “a touch of melted butter will turn that heat into another flavor profile entirely.” After that conversation, we could not wait to try it for ourselves and turned out he was exactly right. We are rethinking our go-to steak recipe now after inhaling the ribeyes we tested. Johnny has over 30 years of trial and error invested in this product and the results have certainly shown themselves as more than satisfactory. You can find more about this winning combination of spices from his website www.BlowinSmokeGrillers.com. Lillie’s Q…More than just a great restaurant! Growing up in Greenville, SC, Charlie McKenna learned very early on about the art of true Southern BBQ. Grandma Lillie made sure of it. So when Charlie first opened the flagship Lillie’s Q restaurant in Chicago, the goal was simple: Create a Southern-inspired BBQ experience that’s true to regional traditions and reimagined into unique, authentic and delicious flavors. And he hasn’t slowed down since. With multiple restaurants and a variety of sauces, rubs, mixes and more – he’s smokin’ like never before. Now you can have some of Charlie’s (and Quito’s) secret weapons that have won the shoulder division at Memphis in May two times. This entire line of spices and sauces that Charlie and crew have developed are all high-end products. The samples that we have been trying over the past few weeks have really shown us why these products are flying off shelves all over the world! Fresh was the first word that popped up when we broke the seals on the sauces and rubs and a quick taste helped to reiterate that first thought again. Their secret is called Smotherly Love and comes from 100% natural ingredients. Spicy cayenne from Memphis. Black Pepper from Northern Alabama. Apple and Lime Juices from West half of the Carolinas, vinegar from the East and tangy mustard from the South. It’s tradition you can taste. Charlie has even gotten into using these Smotherly Love ingredients in some snacks that include potato chips. We actually got a taste of these last year while visiting them in Memphis and they were off the chain good! Can’t wait to see what is coming next but one thing is for sure…it will not be bad!! 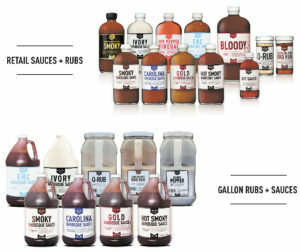 You can see and learn more about these sauces, rubs, snacks and other goodies from their website at www.LilliesQ.com. America. Allan has invested over 10 years in his travels to put this book together. 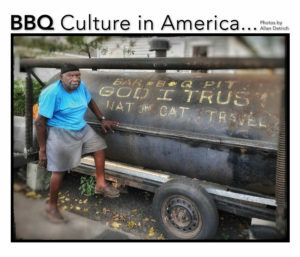 The book itself contains 200 pages of rich and iconic barbecue photos from all over the country. If you are a fan of barbecue roots then you will want to own a piece of this iconic history album. The book also comes in a digital edition as well but the printed edition spoke to us and knocked our sock clean off! We are super proud to add one of these to the must-read section of our book collection and will be moving it to the coffee table ofter as it will be a great conversation piece as well. Allan is also the master of Sauce Shop App as well as the Que Finder App that is set up for any smartphone. Both apps do exactly what they are named to do. The Sauce shop app includes about every BBQ sauce or rub that is worth having while the Que Finder app has been developed to help you find a great barbecue joint regardless where you are at. We use both of these apps regularly and find them beyond useful anytime we need them. You can find more information about all of Allan’s happenings at his website www.thesauceshops.com.